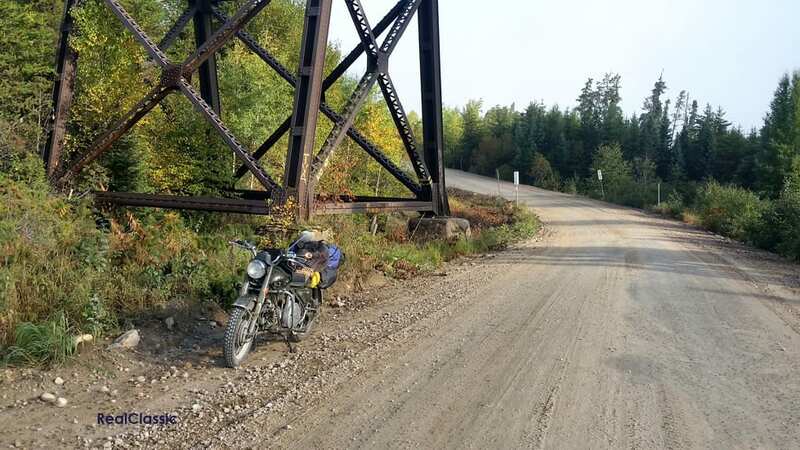 Nick Adams has been riding the unpaved logging roads through Quebec’s forests on his Moto Guzzi Nuovo Falcone. 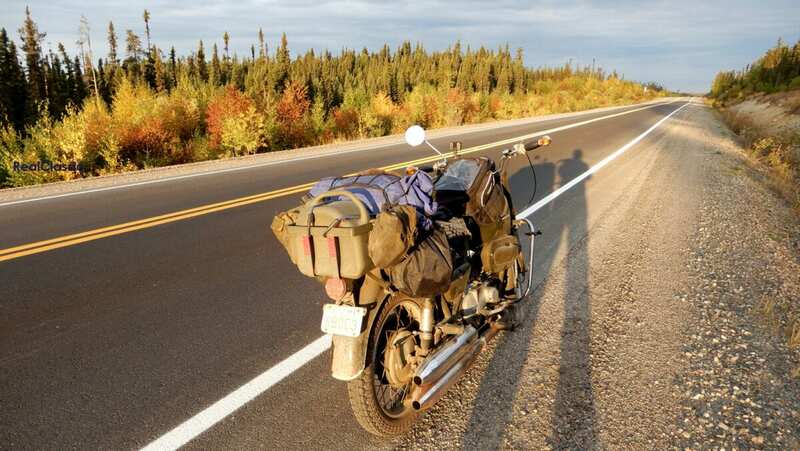 Would a modern adventure motorcycle have been a better choice of two-wheeled transport for this trip? 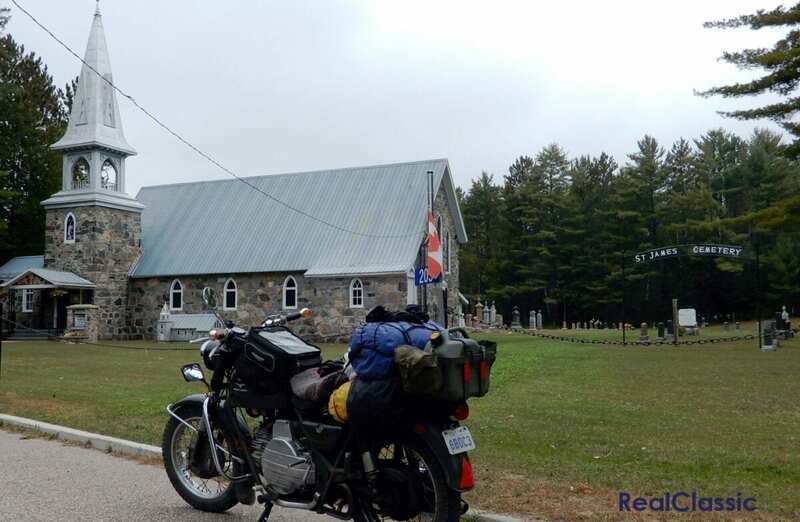 As with the road to Parent, the 120 miles of road between Parent and La Tuque was a well maintained gravel highway and not the forest track I had been anticipating. 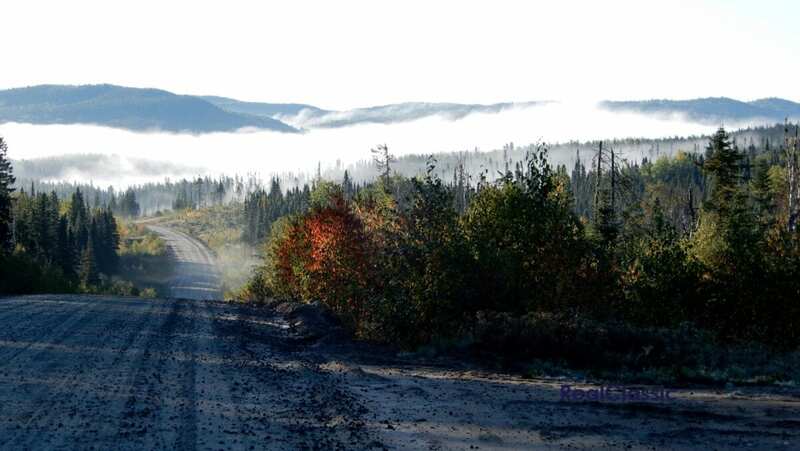 Once the mist had lifted, I cruised along at a comfortable speed, avoiding the numerous dust-filled soft spots, patches of deep gravel and washboard as best I could. A modern bike, with adjustable suspension, knobbly tyres and more power might have covered the distance faster and in greater comfort but I seriously doubt that the experience would have been more enjoyable. There is something utterly charming about the steady thump of an unstressed single cylinder bike. The soggy forks and the sloppy shocks handled the bumps well and whatever they couldn’t manage was absorbed by the sprung seat. I felt safe, comfortable and made good progress. Anyway, I rolled in to the parking lot at Tim Hortons and had a quick sandwich and coffee before heading north out of town. Last time I was in La Tuque a rather nice Honda CBX was in the parking lot. This time though, the Nuovo Falcone stood alone. A few nondescript Harleys blatted past, gratuitously revving so they would be sure to be seen. 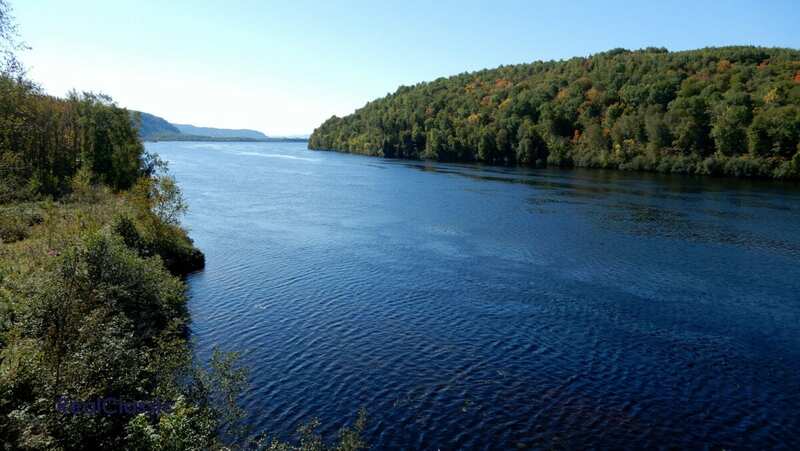 North of La Tuque, Quebec Route 155 follows the Riviere Bostonnais for about 25 miles before the river veers off to the east and the road is left to navigate its way through the thick spruce forests and around numerous lakes to the shores of Lac Saint-Jean. It is a beautifully road with broad paved shoulders. It was quite a relief to ride it after the concentration required to stay upright on the gravel highways of the previous days. Although traffic was light, there was a steady flow of large trucks and SUVs, all of which were travelling faster than the Nuovo Falcone could manage. 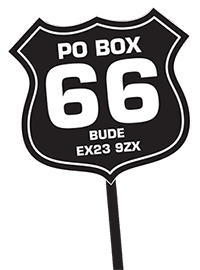 I was humming along at a comfortable 90kph – the posted speed limit – and was the slowest thing moving, especially on the hills where my speed would drop dramatically. So as not to be an obstacle to the other traffic, I got into the habit of moving over onto the paved shoulder whenever I saw another vehicle approaching in my rear view mirror. This worked very well; many of the truck drivers flicking their rear lights in appreciation. Well, it worked well until I chose to do it on a blind hill. I could see the truck approaching in my mirror, so as usual, I moved over onto the metre-wide shoulder and held my speed and position. Another truck appeared over the brow of the hill heading in our direction, just as I noticed that the paved shoulder dramatically narrowed ahead, leaving no more than a tyre’s width paved strip between the road line and the gravel. Under normal circumstances this would have been fine. I would have just moved onto the gravel, but unfortunately this time the pavement edge ended in a steep lip and the gravel shoulder sloped abruptly towards the ditch. I had no choice than to try and ride the narrow strip between the road and the drop-off. The truck driver coming up behind must have seen the situation evolving. He had no time to reduce his speed and couldn’t move over because of the oncoming truck, but he held a perfect line, giving me just enough room to ride that tiny sliver of pavement. It’s a bit unnerving when a massive truck thunders by, its wheels almost brushing your shoulder. It was over in a matter of seconds. The truck sped on and I was able to slide back onto the pavement and resume my ride. It all happened so quickly that I didn’t have any time to be fearful. In retrospect, a single touch from the truck or the slightest waver of my front wheel would have spent me spinning off into the undergrowth, bringing a rapid end to an otherwise pleasant ride. After that little excitement I was a bit more circumspect about moving over, only doing so when I could see that the way was fully clear ahead. 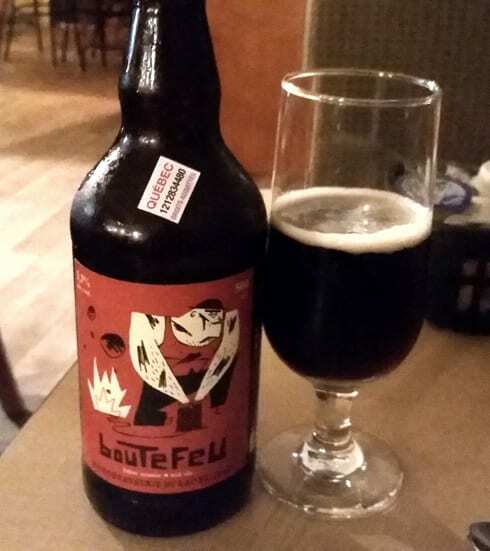 From La Tuque to Chibougamau is 250 miles, so it was well into the evening before I reached the town. The first motel I tried was full but I was given directions to another in the heart of town: also full. More directions were furnished and after some pointless riding around, I found my third alternative, was allocated an adequate room downstairs below a restaurant, and was shown where to park my bike. I couldn’t be bothered to unload all my gear. 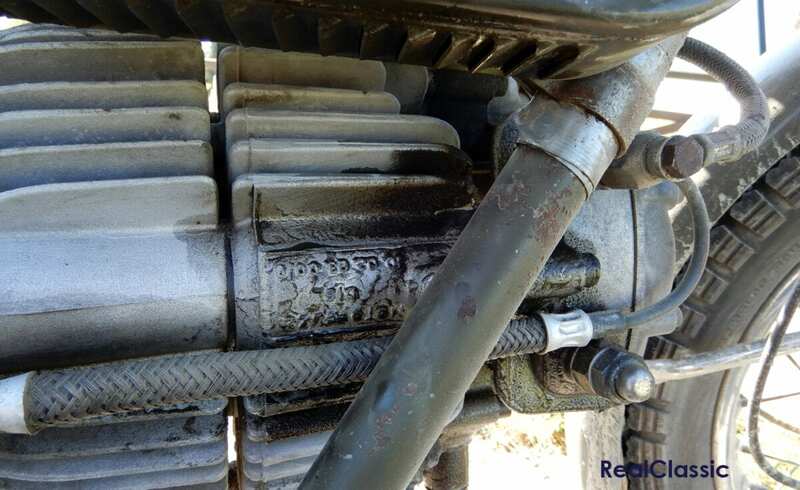 I left it all on the bike, trusting that no-one would be attracted to an old, dust covered bike with bits and pieces of luggage strapped on with bungees. 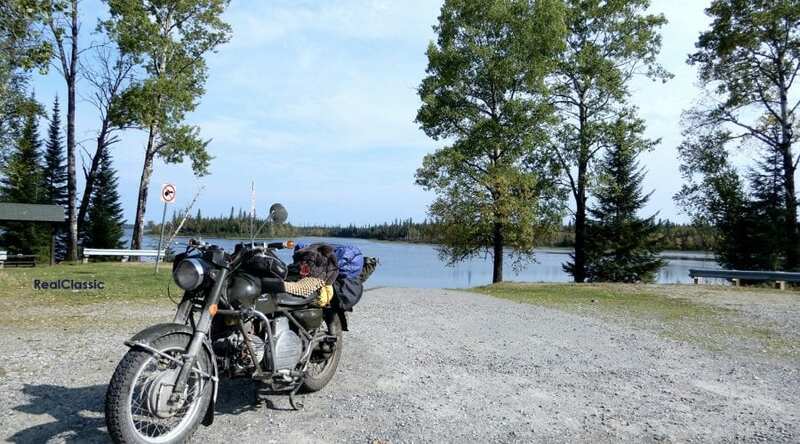 Google maps tells me that it should take about 10 hours and 28 minutes to ride the 589 miles from Chibougamau to my home. On a modern bike – perhaps. On the Nuovo Falcone – not on your life. I had risen early and hunted around until I found the only open gas station at that hour. As I pumped the fuel, I chatted with a local Sûreté du Québec police officer who seemed rather surprised that I’d ridden such clunky and old-looking bike all the way, especially when I told him it wasn’t the first time. He laughed when I told him he was unlikely to be pulling me over for speeding as the bike was barely able to reach the posted limit. Once again, it was a chilly and damp start to the day, but the sun eventually appeared, driving the mist away and warming my chilled fingers. The road home was paved and largely traffic-free. A single cylinder motorbike with a heavy flywheel provides a relaxing ride as long as you’re not trying to break any speed records and don’t spend your riding time wishing for something faster. Twelve hours after leaving Chibougamau I opened my garage door and wheeled the bike in. Other than a slight misting around the top of the pushrod tunnel, it was drip-free, had hardly used any oil and looked perfectly ready to do the same again tomorrow. As for the rider? He could do with a rest.